Looking for a tasty and healthy way to cool down this summer? 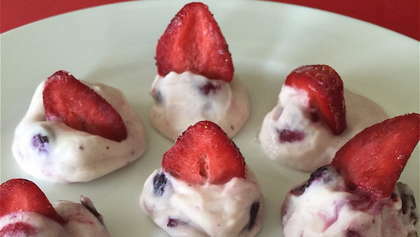 Give these frozen yogurt bites a try! *Additional healthy ingredients can be mixed in such as raisins, sunflower seeds, nuts, dried fruit, dark chocolate bits, coconut, etc. *We used a single serving yogurt cup and made 8 yogurt bites. Recipe can be doubled, tripled, or more. *Store bites in layers of waxed paper in a plastic container in your freezer.